I stopped by Fashion Valley’s Apple Store to check out the iPhone. Given that it’s been on the market for a few weeks, there’s obviously still much interest in this device that is essentially a prototype for future generations of iPods. I managed to find one that was not being molested by a customer and sampled it (oooooh….. aaaaaahhh!). The touch screen display is definitely more sensuous than the iPod‘s clickwheel (which is quite tactile) and puts Star Trek: TNG‘s idea of the touchscreen into the 21st century. Yes, touchscreens have existed in one form or another for almost twenty years, but the iPhone‘s functions in an absolutely flawless way. Almost, anyway. The screen responds well to touch, but the keyboard function, when brought up, takes some getting use to. I just can’t tap the screen with my fingernail, but must touch a “key,” “button,” or icon with the fleshy part of my fingertip. The landscape, or horizontal, presentation of the QWERTY keyboard is preferable, but still difficult to use. 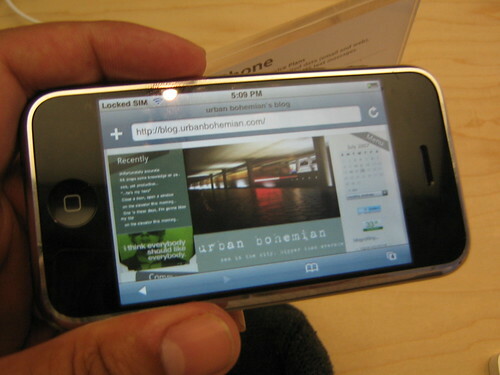 The iPhone has no difficulty pulling up webpages in their full aspect ratios. Width isn’t compromised, but there is little less of the height in the Safari browser. However, scrolling down isn’t too hard. The odd thing about going down in a website is “pushing” the brower with an upward motion by your finger. The one drawback is that the links are extremely tiny, especially the text ones. There should be an iStylus for the iPhone, made in a texture that approximates the softness and firmness of a fingertip. 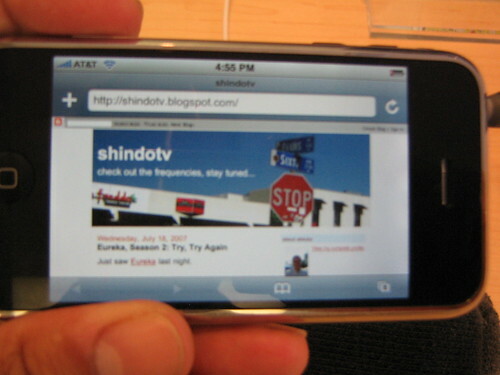 ShindoTV as displayed on iPhone‘s Safari Browser. Ramblings of a Hopeless Khowaga displayed on iPhone‘s Safari Browser. Urban Bohemian as displayed on iPhone‘s Safari Browser. Given the small drawback with the keyboard, the iPhone makes a wonderful Internet access device. A laptop with WI-FI feels clunky in comparison. I played around with a few other functions, such as the calculator (the 10 key is digit friendly), iCalendar, and a few other applications. That the screen can detect its orientation and adjust the screen accordingly is one of its amazing features. While Zune introduced the basic idea late last year, iPhone makes Zune look like a neolithic knife in comparison. 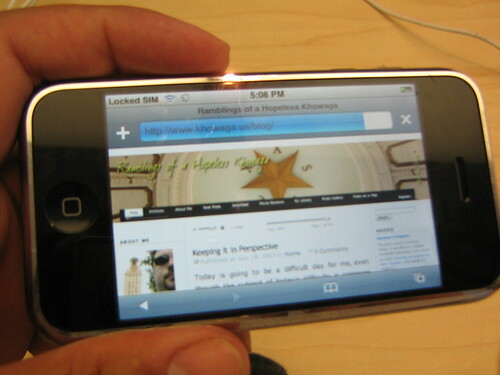 The iPhone adjusts without prompting, while Zune’s screen position must be changed manually. I have written some things about Zune in the past, and my opinion is reinforced by this experience. Sometime last year, iTunes introduces a more visual element to browsing the library by going through the Albums’ artworks by scrolling from side to side. This new feature is perfected in the iPhone, and there’s a more visual menu where one can choose music, video or podcasts with the tap of a finger. The icon menu is much more appealing than the click and view text interface of standard iPods. The sound is excellent (but the demo iPhones used Bose headsets). The iPhone has a camera. Cameras are almost a standard feature mobile phones these days, but the iPhone‘s shutter could also be a logical outcome of the cameras that are now embedded in the iMacs and MacBooks. Like most phones, the iPhone‘s camera has low fidelity, but still can take some decent photos. If you want to take a picture of yourself (as many people are doing), that can be difficult as the “button” is a two dimensional icon on the glass sceen. It’s best to have someone take the picture for you. I managed to get this photo taken. I e-mailed the picture to myself from the iPhone, thus being able to show you my mug. The only thing I didn’t do in my brief exporation of this brave new device was make a phone call. Computing grade: 7 out of 10. Telephone grade: no empirical data available to evaluate mobile phone function.